on top of this we made sure to add some more art assets & animations. 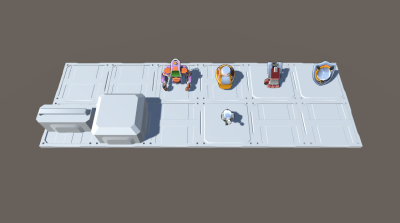 For the art this week we finished some floor and wall models, these will be used in the level and will also be the replacement of the white level blocks. They are grid based and modular. We also finished the Character model rig so we were able to start animating this week. these animations are now also in game as you can see on the gifs. Furthermore we added 3 versions of the character, i.e. three different color combinations. The placeable interactibles like the laser, slime-trap and snare-trap are also made but not yet put in the game. We also have made some changes in texture of the boxes you can push. Now we can take our time to implement the remaining powerups,UI, particles & additional gamemodes and animations as well as filling in the remaining art assets.